Aspirin Exacerbated Respiratory Disease (AERD), also known as Samter’s Triad or aspirin-sensitive asthma, is a chronic medical condition that affects patients with asthma. Patients with AERD present with asthma, recurrent sinus infections and nasal polyps, and sensitivity to aspirin and other anti-inflammatory drugs (NSAIDs). Usually, the first symptom is nasal inflammation with sneezing, a runny nose, congestion, and often a reduced sense of smell. Later, asthma develops and then the polyps occur inside the nose. Polyps can cause sinusitis, post-nasal drip and obstruction of the airways. Finally, aspirin sensitivity develops. This can be serious and can trigger asthma attacks and anaphylaxis (an acute whole body allergic reaction). In some cases this reaction can be so severe that there is a risk of death from suffocation. Patients often also react to other aspirin-type anti-inflammatory drugs like Ibuprofen and Naproxen, although acetaminophen is typically safe as long as it is not used in high doses. Approximately 10 percent of all adults with asthma and 40 percent of patients with asthma and nasal polyps are sensitive to aspirin and NSAIDs. However, this does not necessarily mean that they will develop AERD, but rather that they are at increased risk for the disease. People are most likely to develop AERD in their 20s or 30s, but it can develop at any time. The cause of this condition is unknown, although in some cases there is a genetic component. Current research suggests that the AERD may be caused by excessive production of leukotrienes, which are chemicals involved in the body’s inflammatory response. AERD is a clinical diagnosis, meaning that there is no specific diagnostic test that confirms the diagnosis. However, it can be difficult to diagnose because every patient may not have all three conditions at the same time. Providers may order a Sinus CT scan to look for the presence of nasal polyps and order blood tests as AERD can cause an increase in certain types of white blood cells. Because the disease consists of three separate diagnoses, each part needs to be treated in order to effectively control the disease. Asthma treatment varies based on severity. Some patient may require medication only during an attack while other patients will need daily medication. It is also important that Asthma patients learn the things that trigger their asthma. Hives and swelling, also known as angioedema, are treated with antihistamines and corticosteroids. It is extremely important that any patient with a history of hives and angioedema have epinephrine on hand in case of a severe attack. Nasal polyps can be removed surgically, although they may recur. Corticosteroids also can be used to reduce the size of the polyps. However, if the patient has no discomfort from the polyps, they may not need treatment. Leukotriene antagonists like montelukast (Singulair) may be helpful in treating the triad. 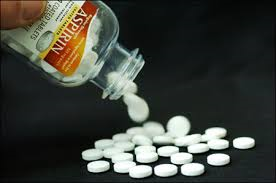 Aspirin and NSAIDs should be avoided. However, many patients can benefit from an Aspirin desensitization program that can be carried out at a trained outpatient facility. Following the desensitization, patients will take a daily maintenance dose of Aspirin. During a successful desensitization procedure, these symptoms will continue to lessen in severity until the patient experiences no reaction at all to a standard dose of aspirin. A diet low in omega-6 oils and high in omega-3 oils may also alleviate symptoms.